You’ve probably heard of a multitude of ways to kickstart labour – raspberry leaf tea, curry, acupuncture, walking or maybe even getting between the sheets – but how about a vigorous dance routine? 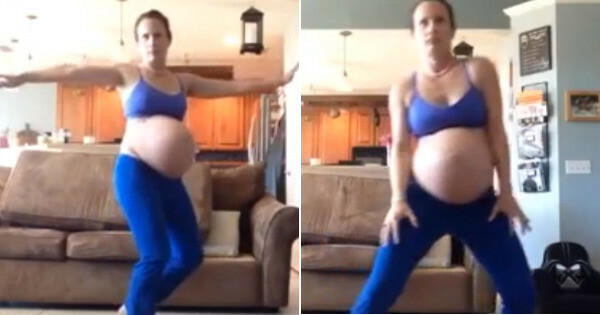 Donning a crop top and leggings, the expectant mum shimmies around her living room to an instructional choreography video. It’s mesmerising, and all the more impressive given her full-term belly. “I’ve always loved Thriller, but I haven’t done the dance in five years,” the 32-year-old tells Yahoo Parenting. “I pulled up a YouTube instructional video, did the dance, and figured I’d record it. I thought it would be something cute to make my friends laugh.” It’s since been seen hundreds of thousands of times. Ms Northsea, who also has a three-year-old son, says her husband was diagnosed with testicular cancer a month ago “so it’s been difficult emotionally recently”. “This video really helped as it has caused me to laugh over and over again,” she writes on YouTube. There’s no update yet on whether the unusual method has helped bring baby two on – but we’re sure he or she will get a kick out of the video in years to come. Did you try to induce your labour? What worked, what didn’t?